The "vow" taken in marriage usually states, "till death do us part". Most agree that marriage should be for life and, certainly, that no minister should ever consider marrying a couple for only a few months or a few years: Yet, we do see homes wrecked by divorce. Innocent children are thereby forced to pay a terrible price for their parents' folly. Churches are wrecked by the evil stigma divorce brings, and the unbelieving world is caused to wonder if there is anything good about religion that allows such evil. Yes, one of the greatest evils in our society is that so many marriages end in divorce. "And this have ye done again, covering the altar of the Lord with tears, with weeping, and with crying out, insomuch that he regardeth not the offering any more, or receiveth it with good will at your hand. Yet ye say, Wherefore? Because the Lord hath been witness between thee and the wife of thy youth, against whom thou hast dealt treacherously: yet is she thy companion, and the wife of thy covenant. And did not he make one? Yet had he the residue of the spirit. And wherefore one? That he might seek a godly seed. Therefore take heed to your spirit, and let none deal treacherously against the wife of his youth. For the Lord, the God of Israel, saith that he hateth putting away: for one covereth violence with his garment, saith the Lord of hosts: therefore take heed to your spirit, that ye deal not treacherously." Marriage is a matter of the Law of God. It is, there­fore, a matter of religious, moral and social concern. Marriage is involved in our religious life, because it is regulated by laws of God. Then it is important that we know the laws of God in order the keep them. In studying the scriptures it is always important to "search" them and to "rightly divide" them. We must consider the proper division of the Bible. The Bible Covenants dealt with marriage violations in different ways, according to God's Law for the time. We must, therefore, consider whom the inspired writer is address­ing, and under what covenant his words apply. Otherwise we could be misguided. When God created the first man on earth He said, "It is not good that the man should be alone..." (Gen. 2:18). He created the woman and brought her unto the man (Gen.2:22) and the first marriage followed. According to Jesus, (Matt. 19:5-6) God then issued His Law in these words: "...for this cause shall a man leave father and mother, and shall cleave to his wife: and they twain shall be one flesh. What therefore God hath joined together, let not man put asunder." Jesus quoted the words spoken at the time God present­ed a man's wife to Him in the Creation (Gen.2:21-25). Jesus was, at the time of this statement (Matt. 19:5-6), dealing with the Pharisees over a point of law concerning the divorcement of wives. To answer their question over this point of law, Jesus referred them to the above decree of God at the beginning. For this reason, especial­ly, we should consider what God said at the beginning to be His Law for marriage. This law of marriage was intended as a universal law, for He said "a man" (not specific men) in Matt. 19:5, as quoted by Christ. Every human is subject to this law in marriage. Before the Law of Moses, it seems that God did not set specific penalties for breaches of His Marriage Law, but He did punish man severely at times for the flagrant violations. We have examples of this in the Flood, the destruction of Sodom, et cetera. "Then came to him the disciples of John, saying, Why do we and the Pharisees fast oft, but thy disciples fast not? And Jesus said unto them, Can the children of the bridegroom mourn, as long as the bridegroom is with them? but the days will come, when the bride­groom shall be taken from them, and then shall they fast. No man putteth a piece of new cloth unto an old garment, for that which is put in to fill it up taketh from the garment, and the rent is made worse. Neither do men put new wine into old bottles: else the bottles break, and the wine runneth out, and the bottles perish: but they put new wine into new bottles, and both are preserved." "And for this cause he is the mediator of the new testament, that by means of death, for the redemption of the transgressions that were under the first testament, that they which are called might receive the promise of eternal inheritance. For where a testament is, there must also of necessity be the death of the testator. For a testament is of force after men are dead: other­wise, it is of no strength at all while the testator liveth." 4. Taught some eternal truths that apply to man under any dispensation. "Ye are the salt of the earth: but if the salt have lost his savor, wherewith shall it he salted? it is thence­forth good for nothing, but to be cast out, and to be trodden under foot of men. Ye are the light of the world. A city that is set on a hill cannot he hid. Neither do men light a candle, and put it under a bushel, but on a candlestick; and it giveth light unto all that are in the house. Let your light so shine before men, that they may see your good works, and glorify your Father which is in heaven." Vs. 17-18 relate to the Law of Moses, as we have already noted above. Vs. 21-24. Some think that any time Jesus said, "Ye have heard it said...but (or "and")..I say unto you", that it means the last instructions are automatically for the new dispensation - but not so: This is a good example: "Ye have heard that it was said by them of old time, Thou shalt not kill; and whosoever shall kill shall be in danger of the judgment: but I say unto you, that whosoever is angry with his brother without a cause shall be in danger of the judgment: and whosoever shall say to his brother, Raca, shall be in danger of the coun­cil: but whosoever shall say, Thou fool, shall be in danger of hell fire. Therefore if thou bring thy gift to the altar, and there rememberest that thy brother hath ought against thee; leave there thy gift before the altar, and go thy way; first be reconciled to thy brother, and then come and offer thy gift." Note that He is actually explaining their own law to them more fully. The word, "judgment", in verse 22, refers to a tribunal "court" that sat in each city or town. History tells us it usually consisted of seven members, and was the lowest court among the Jews. From it a person might appeal a judgment to a high court, the Sanhedrin "council", mentioned in the same verse. Major violations were handled by this council. Now this question: Would Christ tell a Christian he was in danger of the Jewish "council"? NO. So we see this was related to Jewish (Mosaic) law, as in the mention of the "altar" in Vs. 24. Christians do not have "altars". Jesus was here explaining the Jews' own law to them - not giving new law as some tend to believe. "Again, ye have heard that it hath been said by them of old time, Thou shalt not foreswear thyself, but shalt perform unto the Lord thine oaths: but I say unto you, Swear not at all; neither by heaven; for it is God's throne: nor by the earth; for it is his footstool: neither by Jerusalem; for it is the city of the great king. Neither shalt thou swear by thy head, because thou canst not make one hair white or black-. But let your communication be, Yea, yea; Nay, nay: for whatsoever is more than these cometh of evil." "Ye have heard that it hath been said, An eye for an eye, and a tooth for a tooth: but I say unto you, That ye resist not evil: but whosoever shall smite thee on thy right cheek, turn him the other also. And if any man will sue thee at the law, and take away thy coat, let him have thy cloak also. And whosoever shall compel thee to go a mile, go with him twain. Give to him that asketh thee, and from him that would borrow of thee turn thou not away." "Ye have heard that it hath been said, Thou shalt love thy neighbor, and hate thine enemy. But 1 say unto you, Love your enemies, bless them that curse you, do good to them that hate you, and pray for them that despitefully use you, and persecute you; that ye may be the children of your Father which is in heaven: for he maketh his sun to shine on the evil and on the good, and sendeth rain on the just and on the unjust. For if ye love them which love you, what reward have ye? do not even the publicans the same? And if ye salute your brethren only, what do ye more than others? do not even the publicans so? Be ye therefore perfect, even as your Father which is in heaven is perfect." "It hath been said, Whosoever shall put away his wife, let him give her a writing of divorcement: But I say unto you, That whosoever shall put away his wife, saving for the cause of fornication, causeth her to com­mit adultery: and whosoever shall marry her that is divorced committeth adultery." It is important to note that in vs. 31, there are two distinct acts mentioned. One would be "put away", the other, "give her a writing of divorcement". It follows that one could "put away" (separate from, in this case) his wife without divorcing her. The word translated "put away" here does not mean "divorce" - but means to depart, dismiss, cause to leave, et cetera. The rule had been made, "If you are going to put away your wife, give her a divorce." (vs. 31). "Defraud ye not one the other, except it be with consent for a time, that ye may give yourselves to fasting and prayer: and come together again, that Satan tempt you not for Your incontinency." We can see he must also share the blame if she falls. Of course, as Jesus mentions, if she is already guilty of fornication her husband would not, in such case, cause her to fall by leaving or putting her away. Now look at the last part of vs.32. "...And whosoever shall marry her that is di­vorced committeth adultery." "Nevertheless, to avoid fornication, let every man have his own wife, and let every woman have her own husband. Let the husband render unto his wife due bene­volence: and likewise also the wife unto the husband. The wife hath not power of her own body, but the hus­band: and likewise also the husband hath not power of his own body, but the wife. Defraud ye not one the other, except it be with consent for a time, that ye may give yourselves to fasting arid prayer; and come together again, that. Satan tempt you not for your incon­tinency." (1 Cor.7:2-5). "And unto the married I command, yet not I, but the Lord, Let not the wife depart from her husband: but and if she depart, let her remain unmarried, or be reconciled to her husband; and let not the husband put away his wife." (1 Cor.7:10-11). "...to avoid fornication, let every man have his own wife, and let every woman have her own husband. Let the husband render unto the wife due benevolence (her conjugal rights, RSV); and likewise also the wife unto the husband...defraud ye not one the other...that Satan tempt you not for your incontinency And unto the wife I command, yet not I, but the Lord, let not the wife depart from her husband: but and if she depart, let her remain unmarried, or be reconciled to her hus­band; arid let not the husband put away his wife." (1 Cor.7:2-5, 10-10. And in vs. 39), "The wife is bound by the law as long as her husband liveth; but if her husband be dead, she is at liberty to be married to whom she will; only in the Lord." Only death dissolves a marriage! "And whosoever shall marry her that is divorced com­mitteth adultery." wife is bound by the law as long as her husband liveth." Israel was "married" to God, in the spiritual sense, and remained so until "death", as shown in Rom.7:4: "Wherefore, my brethren, ye also are become dead to the law by the body of Christ; that ye should be married to another, even to him who is raised from the dead, that ye should bring forth fruit unto God." God was married to Israel until the fulfilling of the Law of Moses when Christ died on the cross. The Law - and the "marriage" - then became "dead", as shown above, allowing Christ to become the Bridegroom of God's people, the church. But note: Even though God "divorced" Israel, He still considered "her" as married to Him (Jer. 3:14) until "de­ath" (Rom. 7:4). Only death dissolves a marriage! "The Pharisees also came unto him, tempting him, and saying unto him, Is it lawful for a man to put away his wife for every cause? And he answered and said unto them, Have ye not read, that he which made them at the beginning made them male and female, and said, For this cause shall a man leave father and mother, and shall cleave to his wife: and they twain shall be one flesh? Wherefore they are no more twain, but one flesh. What therefore God hath joined together, let not man put asunder. They say unto him, Why did Moses then command to give a writing of divorcement, and to put her away? He saith unto them, Moses because of the hardness of your hearts suffered you to put away your wives: but from the beginning it was not so. And I say unto you, whosoever' shall put away his wife, except it be for fornication, and shall marry another, committeth adultery; and whoso marrieth her which is put away doth commit adultery." To know the truth we must consider all that is said in a connected context; when (under what covenant) it applies; and to whom the instructions are addressed. 1. The whole passage was a conversation between Jesus and the Pharisees. The scriptures show that under the Law of Moses adultery was to be punished by stoning to death. We see clearly fornication required death by stoning by the Law of Moses. "And the scribes and Pharisees brought unto him a woman taken in adultery; and when they had set her in the midst, they say unto him, Master, this woman was taken in adultery, in the very act. Now Moses in the law commanded us, that such should be stoned: but what sayest thou?" Jesus must have been aware of this when they asked Him, "is it lawful for one to put away his wife...?" (Matt.19:3) The present-tense question, "IS it lawful", must be considered along with Jesus' declaration in Matt. 5:17-18, that no part of the Law would be removed until all would be fulfilled. "And he answered and said unto them, Have ye not read, that he which made them at the beginning made them male and female, and said, For this cause shall a man leave father and mother, and shall cleave to his wife: and they twain shall be one flesh: Wherefore they are no more twain, but one flesh. What therefore God hath joined together, let not man put asunder." This Law, as we have noted, did not provide for divorce and remarriage - but rather that "they are no more twain but one flesh." 3. After Jesus' answer (vs.4-6), these Pharisees gave a rebuttal question: "Why did Moses then command to give a writing of divorcement, and to put her away?" (vs 7). We must consider the death-penalty which their law prescribed for the adulterous partner (death by stoning, John 8:5; Deut. 22:13-30) - which law we know was re­moved at the cross. 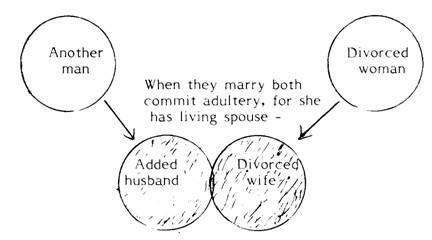 Therefore, if a man came before the magistrate to put his wife away for fornication or adultery, and if he had sufficient proof of this charge, their existing law would automatically demand the death penalty, and if they did what "was lawful" in the matter, the man would soon be free to marry another wife, for his wife would then be dead! "Know ye not, brethren, (for 1 speak to them that know the law,) how that the law hath dominion over a man as long as he liveth? For the woman which hath an husband is bound by the law to her husband so long as he liveth; but if the husband be dead, she is loosed from the law of her husband. So then if, while her hus­band liveth, she be married to another man, she shall be called an adulteress: but if her husband be dead , she is free from that law; so that she is no adulteress, though she be married to another man." (Rom. 7:1-3) We see clearly death, and only death, can loose the marriage bond. "When a man hath taken a wife, and married her, and it come to pass that she find no favour in his eves, because he hath found some uncleanness in her: then let him write her a bill of divorcement, and give it in her hand, and send her out of his house. And when she is departed out of his house, she may go and be another man's wife. And if the latter husband hate her, and write her a bill of divorcement, and giveth it in her hand, and sendeth her out of his house; or if the latter husband die, which took her to be his wife; her former husband, which sent her away, may not take her again to be his wife, after that she is defiled; for that is abomination before the Lord: and thou shalt not cause the land to sin, which the Lord thy God giveth thee for an inheritance." What is overlooked by many is that Jesus, in Matt.19:- 7-8, renounced what Moses had "suffered" (allowed, in Deut. 24:1-4, above) as being no part of the law of God, hence, was never lawful in God's sight - "not so" -"from the beginning". This declaration completely elimi­nated all discussion and conjecture as to what the "un­clean thing" was that Moses referred to; thereby throwing out the whole divorce-and-remarriage deviation of Moses - leaving the only then-lawful-provision for a fornicator as being death by stoning. "And in the house his disciples asked him again of the same matter. And he saith unto them, whosoever shall put away his wife, and marry another, committeth adultery against her. And if a woman shall put away her husband, and be married to another, she committeth adultery." "And I say unto you, whosoever shall put away his wife, except it be for fornication, and shall marry ano­ther, committeth adultery: and whoso marrieth her which is put away doth commit adultery." a. John marries Mary. She is later found guilty of co-habiting with another man, whereupon John divorces her - but she is not put to death. Shall we construe Matt.19:9 (above) to say that John may marry another without committing adultery? Many do! - in spite of what Jesus said to His disciples in Mk. 10:11-12 and what the Spirit said in 1 Cor.7:1-11,39. 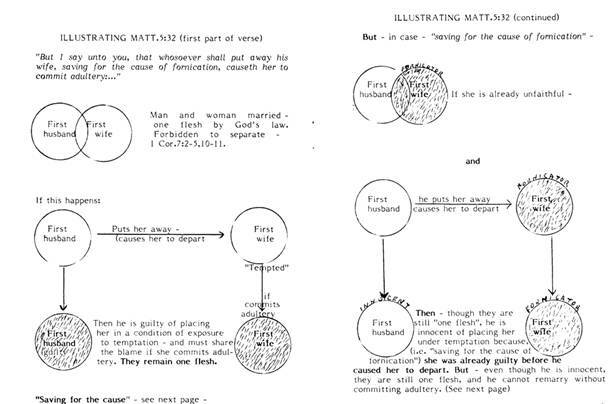 These scriptures show the departed mate must "remain unmarried" (not seek another mate); that if either spouse puts away the mate and "marries another", adultery is committed; and that only death can dissolve marriage. b. Bill marries Jane. Bill later is found guilty of co-habiting with another woman. Many say - contrary to what Jesus said in the latter part of Matt. 19:9 ("...and whoso marrieth her which is put away doth commit adultery. "), that Jane may divorce Bill and marry another without adultery being committed. They reason that Jane is "innocent" - that the unfaithfulness of her hus­band, Bill, allows her to remarry. Not so: Read the scriptures again. Jesus said again, in Lk. 16:18, "Whosoever putteth away his wife, and marrieth another, committeth adultery: and whosoever marrieth her that is put away from her husband committeth adultery." Jesus does not now grant divorce and remarriage - Fornication is not now an "EXCEPTION". "So ought men to love their wives as their own bodies. He that loveth his wife loveth himself. For no man ever yet hated his own flesh; but nourisheth and cherish­eth it, even as the Lord the church. For we are members of his body, his flesh, and of his bones. For this cause shall a man leave his father, and mother, and shall be joined unto his wife, and they two shall be one flesh. This is a great mystery: but I speak concerning Christ and the church. Nevertheless let every one of you in particular so love his wife even as himself; and the wife see that she reverence her husband." "Know ye not, brethren, (for I speak to them that know the law) how that the law hath dominion over a man as long as he liveth? for the woman which hath an husband is bound by the law (taw of marriage, GSB) to her husband so long as he liveth; but if the husband be dead, she is loosed from the law of her husband. So then if, while her husband liveth, she be married to another man, she shall be called an adulteress: but if her husband be dead, she is free from that law; so that she is no adulteress, though she be married to ano­ther man." (vs.1-3). "Wherefore, my brethren, ye also are become dead to the law (law of Moses) by the Body of Christ: that ye should be married to another, even to him (Christ) who is raised from the dead, that we should bring forth fruit unto God." Now consider this: Eph. 5:28-31 with Rom. 7:1-4 show the oneness - the lawful one-flesh unity of man and wife as also of Christ and His Church. This marriage law shows clearly that for re-marriage to take place (whether physical or spiritual) death in the first marriage must occur first. The closeness of the union (until death) of man and his wife is used to show the closeness of the union of Christ with His church under the binding force of God's marriage Law for life - not only for man and wife, but also .for God and His people. This question: Do we believe the church could divorce Christ - marry another (as it were) and be acceptable to God? Or vice versa? No: Marriage is for life! In Lev. 21:7, speaking of the Levitical priests, "And shall not take a wife that is a whore, or profane; neither shall they take a woman put away from her husband: for he is holy unto his God." We see here no priest was permitted to marry a divorced woman. If a divorced woman would defile a holy man (priest) of an earthly priesthood (sanctified by the blood of animals), where does the "royal priesthood" (sanctified by the blood of Christ) get the authority to marry or give in marriage, divorced persons? The priesthood of Levi was a type of the Christians -holy persons. We find that no one who was holy or set apart for a holy purpose, as was the Levitical priesthood under the old covenant, or Christians under the new, ever did have the privilege of marrying a divorced person by divine authority, under any age of the world's history.